How often are you creating downloadable digital content such as tutorials and ebooks? How many tools have you used for creating them and finding a tool to display them in the nicest way possible? Whether you are conducting a digital content marketing campaign, you are a teacher, a student or in need for some business reports and presentations, you need a tool that makes your materials look nice and professional. You may also need a tool that helps you make collections of ebooks and other publications, and keeps them neatly organized. For this, you need two things: A creation and design software and a virtual bookshelf. What if I told you that you can get both on the same platform? It is called Flipsnack and it offers just the right tools for creating digital content and at the same time, a virtual bookshelf to present some of your creations. What are flip books and bookshelves good for? Before getting into details about how to create and use a digital bookshelf, let’s talk a bit about flipbooks, as the digital page flip publications that you can create for business, personal or educational uses. If you own a website, blog or eCommerce shop, I am sure you have already planned some marketing campaigns for the next months. Or, at least, you have thought about starting one. One of the easiest ways to start a marketing campaign is to give something back to your fans, customers and followers by creating and sharing with them valuable content for free. Magazines, guides, tutorials and ebooks. If you already have a printed magazine, you probably don’t want all articles to be published on the website. Or at least not as long as the printed version is available in stores. So, you can digitalize a part of the magazine (a preview) and give it for free to readers to entice them. You could also digitalize the entire content and sell it in this format to those who want a digital version. Besides magazines, you can create content in the form of guides, ebooks and tutorials that you can share with your readers. Brochures. 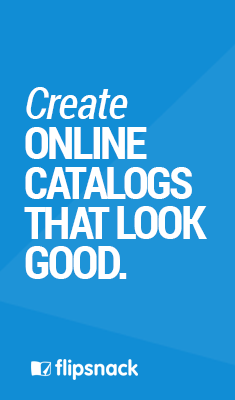 Create or upload brochures for your products and share them with customers or followers. Presentations. They can be effective in your content marketing campaigns, as long as they contain valuable information about topics of interest for your customers or readers. Presentations may also be useful for business meetings and for educational purposes. Photo albums. Are you a photographer and you want to share some of your albums with your fans? Create a photo album of your best shots that can be browsed online, with or without a download option. You can also use Flipsnack to create promotional materials for your eCommerce website or local establishment. What can you create and share with your virtual bookshelf? Menus for bars and restaurants. Do you need a personalized, good looking menu? Well, you can design it in Flipsnack using one of our ready-made menu templates. Embed it in your website or share it on social media. Need it in print? No problem, there’s a download PDF option that you can use for print. Product catalogs. Let’s say you have an eCommerce website or a local shop with a blog. You can use Flipsnack to create a promotional catalog or a or a product catalog and embed it into your website. Of course, with the bookshelf feature, you can present several catalogs of this kind, based on categories or products types and uses. Promotional brochures. Of course, if you have an eCommerce website or a local shop, you can also make a promo brochure presenting offers and sales. Portfolios. If you are a freelance writer, designer, composer etc., you may need to show some samples of your work and a great looking portfolio. A flipbook shared on your website may make a difference. However, if you want to show multiple samples of your work, for different clients, you can share them as a portfolio bookshelf. Let’s say you are a teacher and you have several PDFs (learning materials, courses as presentations) that you share with your students. If you are invited as a spokesperson in another location, school or at an event, you can use a flipbook as a presentation for your seminar. It’s very easy to create such documents online and to upload them into your bookshelf to keep them organized, all in just one place. You’ll have access to them anytime, anywhere. All your work related presentations can be uploaded into a digital bookshelf. Thus, they can be easily shared with all your colleagues and employees who are not able to see the live presentation or for future references. You can create multiple bookshelves to present collections of documents related to your line of work. Make them available to all employees, who might need them in the future. Creating visual digital documents these days is quite easy. There are several tools and software available online and offline to choose from. However, I would recommend Flipsnack, for its easy learning curve and of course, its professional look. You can create all of the above mentioned types of documents on this powerful platform. Once you learn how to work with this tools, you will find out that you can also save time. You can upload any PDF files and give them a new stylish look in just a few minutes. Flipsnack has a built in virtual bookshelf app. When you upload files to create a bookshelf, they are saved automatically in the cloud so you and your readers will always gave access to them. It’s a great way to organize your content and have instant access to your publications. All you have to do is upload your books or magazines first, one by one. Make sure you publish them. Next, make your bookshelf. Here’s a GIF tutorial for that. Now that you have displayed your collections of files in your electronic bookshelf, it’s time to find out how you can use it. 1. Share it on social media accounts. You can share your bookshelf on different social media accounts, pages and groups as a means to digital content marketing. 2. Embed it into your website. You can also embed the bookshelf on a page, on the sidebar of your blog or inside a post. This way readers will have quick access to your flipbooks, magazines and tutorials. 3. Quick access to your stuff. Sometimes, you have many PDF documents that you want to share with your audience. With the virtual bookshelf, you can easily create collections for different kinds of topics and give readers quick access to them through your website. 4. Great use for students who can share educational files or keep all their courses in just one place. Teachers can also create virtual bookshelves and share them with students. They can also update specific bookshelves as soon as they have new courses, presentations and guides. We’ve learned throughout this short guide what digital flipbooks are and how important and valuable a virtual bookshelf can be. If you are creating guides, magazines or presentations quite often, then keeping all these documents in the same place can be really helpful. At the same time, it helps to have a way to display them in a stylish way, and Flipsnack does a great job with this. How often do you have to create presentations, booklets, books, guides or tutorials? Did you try Flipsnack? What about bookshelves? What are your insights on these tools? Feel free to share them with me and the rest of the people who are reading this short guide in the comments section available below.